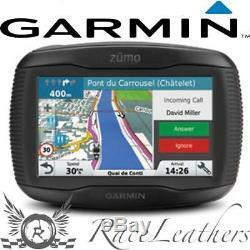 GARMIN ZUMO 345 LM WESTERN EUROPE GPS SAT NAV ROUTE FINDER FREE LIFETIME MAPS. GARMIN ZUMO 345 LM Western Europe. Motorcycle Navigation Adds An Adventurous Twist. Glove-friendly, sunlight-readable 4.3-inch touchscreen display; resistant to fuel vapour, UV rays and harsh weather (IPX7). Detailed map of a region of Europe with free lifetime5 map updates. Garmin Adventurous RoutingT finds curvy or hilly roads; limits major highways. Rider alerts for sharp curves, railway crossings, safety cameras and more. Control music from MP3 player or smartphone3 right on z? Built for Adventure, Born to Ride Featuring Garmin Adventurous RoutingT options for those twisty, hilly, terrain-hugging rides you love - plus a bright, glove-friendly 4.3-inch touchscreen that is easy to read and intuitive to use -z? Mo 345LM is the navigator built to thrill. The Benefits of Bluetooth® Sync your z? Enjoy Some Travelling Music Want to take your own soundtrack along for the ride? Mo also lets you control music and media from a compatible MP3 player or smartphone2, right on your touchscreen display. Keep a Sharper Lookout with Rider Alerts To enhance road awareness and encourage a safer ride, z? Mo 345LM provides helpful alerts for sharp curves ahead, speed changes, railway and animal crossings, school zones and more. Additionally, you're notified when you're about to drive the wrong way on a one-way street. You also receive alerts for nearby red light and speed cameras¹. Plus, for longer rides, a fatigue warning4 will even suggest break times and potential rest areas worth considering after hours on the road. Mo Up Ahead feature lets you easily see places of interest and milestones along your route, without leaving the map view on your navigation display. Plus, Easy Route Shaping lets you add a point on the map to adjust your route, so you can ride through preferred areas or follow specific roads. No More Running on Empty A built-in trip computer with digital fuel gauge comes standard with your z? So it's easy to estimate how many miles you can ride before you'll be running on empty. Dynamic fuel stop alerts actually prompt you when it's time to refuel and even provide petrol station location options. A helpful speed limit indicator lets you know when it's time to throttle down. Plus, a digital compass display and a database of motorcycle-specific points of interest (POIs) are on hand to help you locate repair services, dealers and more. There's also a Service History Log on your z? Mo to help you keep track of service dates, mileage and performed maintenance on your bike. Guidance Using Recognisable Landmarks Garmin Real DirectionsT on the z? Mo 345LM virtually redefine the concept of spoken turn-by-turn directions. In addition to speaking street names, your z? Mo offers guidance using recognisable landmarks, buildings and traffic lights e. "Turn right after the red building". And thanks to Foursquare® data, z? Mo is preloaded with millions of new and popular places to explore. Mo 345LM includes free map updates5 for the useful life of your device, so routes reflect the most up-to-date points of interest and maps available. Navigation Tools Lane assist with junction view displays junctions and interchanges on your route to ease navigation through complex transitions. A brightly coloured arrow on the z? Mo display indicates the proper lane position needed for your next turn or exit. There's also a TracBack® feature on z? Mo that allows you to navigate the same route, in reverse, for your return trip. Tyre Pressure Monitoring For added protection on the road, z? One TPMS is required for each tyre and will work with metal valve stems only. TPMS uses wireless technology to transmit the tyre pressure data, letting you view it in real time right on your z? VIRB® Camera Compatibility To record the highlights of your ride, z? Remotely control VIRB - start and stop recording - all from from your z? It's easy and fun to record and relive every adventure. Updates and Extras Use Garmin ExpressT to keep your z? Mo 345LM up to date. Garmin Express makes it easy to update maps and software, transfer favorites to and from devices and install free custom vehicles and voices. ¹Red light and speed camera warnings are not available in all regions. ³Music and media control work with iPhone® 4S or later and iPod touch® 2nd Generation or later. The fatigue warning activates after longer periods of riding without any long stops along the route. Lifetime Maps Terms & Conditions. Not intended for automotive use. The Bluetooth® word mark and logos are registered trademarks owned by Bluetooth SIG, Inc. And any use of such marks by Garmin is under license. IPhone and iPhone touch are registered trademarks of Apple. RaceLeathers Motorcycle Clothing prides itself on supplying stuff. Stuff for people who want stuff. Not just any old stuff but cool and useful motorbikey stuff. Stuff like helmets and jackets and pants and gloves and.... The very stuff that can make the difference between dusting yourself off and wondering how to get those scuffs off your bike or going off to the hospital to have some not so very nice stuff done to your throbbing sore bits. The stuff (bought cheaply but new on a very tight budget) finally arrived. Ok, and that was it, nothing special and kinda..... He raised one eyebrow, scratched his chin and thought to himself I'm sure that if I tried then I could do this.. So off he went with a spark in his eye and a mission to fulfil. The stocks of stuff grew and grew in size until the place was stuffed. RaceLeathers now encompasses the whole of the ground floor of Britannia Mill an old weaving mill, a welcoming building full of character with stone floors and wooden beams amongst other stuff. Today, RaceLeathers supplies motorcycle related stuff all around the world from Iceland to the depths of Australia and anywhere in-between. The stuff we supply is from quality, well known established brands which have vast experience in the motorcycle industry ensuring you that all the stuff you see has been well thought out with functionality, safety and value in mind. We pride ourselves on being very approachable with good advice about stuff always offered if required. You will always be made to feel welcome, never hurried, never pressured. We don't go out of our way to sell stuff, we give advice and provide options to help you get the right stuff for your needs and should you ever feel otherwise you can always to tell us to "get stuffed". Your safety is our priority. This means that a replacement product cannot be sent out so soon either. Our courier sends emails to all our customers on our behalf to let you know that the item is on its way to you. It is not in the drivers best interest to not leave a card because they only get paid on sucessful deliveries. The couriers will try to deliver twice and after that you will be expected to collect the item from the depot. Should this happen you will be required to take some proof of ID with you or the parcel cannot be handed over. If we don't know, we can't help. In all cases please note. Please don't assume that if a product shows 48 hour courier that you will have the item within 48 hours. Want to feel the weight of that special helmet? Need to know measurements of an item? Are you torn between 2 or more items and need assistance deciding which? Parking is available on street or in the car park at the rear of the building. Add our store to favorites to get all the latest trend updates and promotional offers. The item "GARMIN ZUMO 345 LM WESTERN EUROPE GPS SAT NAV ROUTE FINDER FREE LIFETIME MAPS" is in sale since Thursday, June 7, 2018. This item is in the category "Vehicle Parts & Accessories\GPS, Audio & In-Car Technology\GPS & Sat Nav\Fixed Sat Nav". The seller is "raceleathers" and is located in Darwen, England. This item can be shipped worldwide.